Routine replacement of consumable components in your closed cycle helium system is essential to maintaining optimal performance. The sole purpose of the adsorber in your helium compressor is to trap oil vapor before it enters the pump. Without a fully functioning adsorber, oil tends to condense in the closed helium circuit, which results in oil deposits around seals and displacers. Should this occur, it limits the ability of your cryopump to achieve the low temperatures necessary to run your process at optimal levels. 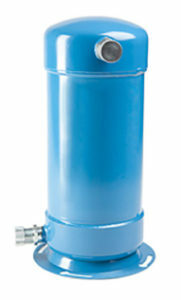 Adsorbers are filled with a proprietary sorbent material used to trap the excess oil vapor as helium passes from the compressor’s heat exchanger. This material has a finite trapping capacity, and replacement of this adsorber is recommended every 1-2 years for most applications. Trillium maintains a stocked inventory of new and remanufactured adsorbers that are compatible with all major helium compressor models. Remanufactured adsorbers are disassembled, cleaned, and then fully rebuilt with all new materials. Each adsorber is checked for helium leaks, evacuated, and charged with 270psi UHP (99.999%) helium. To minimize system downtime, reduce environmental impact, and minimize cost, Trillium offers our Adsorber Advance Exchange program. Simply order your replacement adsorber, replace and return the spent core in the reusable, pre-addressed packaging in order to get credit against your next purchase. Whether you want to purchase new or refurbished, or do an exchange refer to the table below to find the adsorber you need.